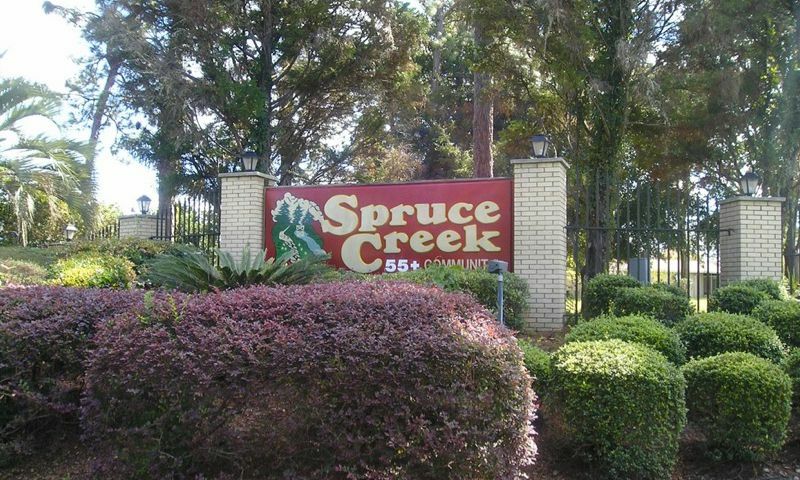 Spruce Creek North is a 55+ community in Ocala, Florida. This age-restricted neighborhood was one of the first Del Webb communities in Ocala and is known for its affordable, low-maintenance homes and charming amenities. Active adults can enjoy a social lifestyle in Spruce Creek North with a wide selection of organized groups, clubs, and events that will keep their social calendars full all year long. Located in Marion County, Spruce Creek North is close to major roads as well as plenty of shopping, dining, and recreational options. Residents living in this reasonably priced active adult community will enjoy a quiet neighborhood setting that's also near daily conveniences and attractions. Charming amenities are held at Spruce Creek North's clubhouse. Here, residents gather in the multi-purpose room to socialize with friends and family. They can avoid pricey gym memberships by using the exercise room. A catering kitchen is handy when preparing a snack for a club meeting. Residents can have some fun in the billiards room as well. Outdoors, homeowners can take a dip in the pool or lounge on the patio to get some sun. Staying active outside is easy with shuffleboard and bocce ball courts as well as horseshoe pits. They can also take leisurely strolls throughout the neighborhood on the walking and biking trails. A gazebo and scenic pond add a natural beauty to this 55+ community. Del Webb built Spruce Creek North between 1987 and 1998. This active adult community consists of about 400 single-family residences that homebuyers can purchase on a resale-only basis. Single-family homes range in size from approximately 800 to just over 1,800 square feet. They have two or three bedrooms, one or two bathrooms, and an attached one or two-car garage. Homes in Spruce Creek North are frame construction with vinyl or aluminum siding. Other features include tile or wood floors, stainless steel appliances, enclosed Florida rooms, storage rooms, and patios. Residents enjoy a low-maintenance lifestyle in Spruce Creek North. An established homeowners' association (HOA) fee takes care of common area maintenance, access to the clubhouse, trash pick up, security patrol, and basic cable. Thanks to the HOA taking care of tedious exterior home chores, residents have more time to pursue fun hobbies. Spruce Creek North has a long list of clubs, events, organized groups, and activities. Homeowners can choose to be as active and social as they wish by participating in things like ball club, craft club, poker, water walking, Friday mixers, socials, pancake breakfasts, and line dancing. New homeowners also get a warm welcome into the neighborhood by the New Resident Greeter. Other activities like bridge, bowling, bingo, Mah Jongg, and crazy quilters will keep residents' social calendar busy any day of the week. Spruce Creek North in Ocala, Florida, enjoys a convenient location that's close to everything active adults would want or need. The community is close to Interstate 75 and Highway 200, which make driving around town easy. Royal Oaks Golf Club is just a few minutes down the street from Spruce Creek North. There are plenty of restaurants and fast food chains as well as retail stores like Walgreens, Walmart Supercenter, Bealls Department Store, and Big Lots. Medical facilities such as TimberRidge Medical Center, Prompt Primary Care of Ocala, and Senior Wellness Community Center are all just a few minutes away. Great attractions like the Florida Horse Park and Don Garlits Museum of Drag Racing are 20 minutes away. When traveling farther is necessary, Ocala International Airport can be reached in less than 20 minutes. Spruce Creek North is a quiet 55+ community that offers charming amenities and affordable homes in Central Florida. There are plenty of activities available in Spruce Creek North. Here is a sample of some of the clubs, activities and classes offered here. Single-family homes range in size from approximately 800 to just over 1,800 square feet. They have two or three bedrooms, one or two bathrooms, and an attached one or two-car garage. Homes in Spruce Creek North are frame construction with vinyl or aluminum siding. Other features include tile or wood floors, stainless steel appliances, enclosed Florida rooms, storage rooms, and patios. Please Note: Floor plans are not available at this time. 55places.com is not affiliated with the developer(s) or homeowners association of Spruce Creek North. The information you submit is distributed to a 55places.com Partner Agent, who is a licensed real estate agent. The information regarding Spruce Creek North has not been verified or approved by the developer or homeowners association. Please verify all information prior to purchasing. 55places.com is not responsible for any errors regarding the information displayed on this website.